Over 30,000 runners took part in the Edinburgh Marathon Festival in the nation&apos;s capital on 27th & 28th May. Runners from all over the world gathered for Scotland&apos;s biggest running festival, taking part part in the Marathon, Half Marathon, Team Relay, 10k, 5k and Junior Races across an action-packed weekend. Sunny weather made for perfect running conditions for the elite fields on one of the world&apos;s fastest marathon courses, where Kenyan dominance of the event continued in both the male and female races. Julius Kiplagat Korir took a decisive victory in the men&apos;s race, breaking clear in the last few miles to blow away the opposition in a winning time of 2 hours, 17 minutes and 13 seconds. Fellow Kenyan, Stanley Kiprotich Bett took second place in 2 hours, 19 minutes and 9 seconds, followed closely by crowd favourite and star of &apos;Running with the Kenyans&apos;, Japhet Koech with a time of 2 hours 20 minutes and 35 seconds. Afterwards, Korir said: "I really enjoyed the race today. I was in the leading pack for the first 20 miles, then decided that I wanted to make a break for it to win, and was happy that I did." The women&apos;s race was dominated by Kenyan Eddah Jepkosgei. She led from the gun to a six minute victory in 2 hours, 37 minutes and 46 seconds. Afterwards, Jepkosgei said: "Today was tougher than last year, the first half was good but I struggled with the wind in the second half. I&apos;m happy as I&apos;ve cut two minutes off my time from last year, I&apos;d like to come back in 2018 and run 2 hours 34 minutes!" As if running 26.2 miles wasn&apos;t tough enough, local lad Scott Hutchison of Tranent completed the grand slam of marathon, half marathon, 10k and 5k over the weekend. Scott was running for Arthritis Research UK and Pulmonary Fibrosis Trust as both his dad and mother-in-law have been severely impacted by this in recent years. We caught up with Scott after the marathon, which was the last of his four races. He said: "That&apos;s probably the hardest thing I&apos;ve ever had to do in my life, my body is absolute agony! Half way through the marathon was the hardest part of today, but I&apos;m so chuffed that I finished and can&apos;t wait to put my feet up and enjoy a barbecue!" It was a particularly heart-thumping day for Peter Irvine from West Lothian who proposed to his partner Stephen with a personalised medal saying "fancy running a marathon to the altar with me?" at the finish line. Thankfully he said &apos;yes&apos;. Afterwards, he said: "We are completely over the moon. I&apos;m so pleased that Stephen said "yes" to the proposal, I was glad that I managed to convince him to get on stage!" There was a thrilling race at the front of Sunday morning&apos;s half marathon as Italian Pasquale Roberto Rutigliano stormed to victory with a winning time of 1 hour, 9 mins and 39 seconds. Hunters Bog Trotter&apos;s Patryk Gierjatowicz took second place with a time of 1 hour, 10 mins and 42 second, and Arron Larkin of Rotherham Harriers finished in third with a time of 1 hour, 10 mins and 59 seconds. 39 year old Rutigliano said: "This half marathon is fast, very fast! I&apos;m very happy with how my run went today. This is my first time in Scotland and this race, I&apos;d love to come back in 2018!" Glasgow&apos;s Avril Mason was the winner in the women&apos;s race which she led from start to finish. The Shettleston Harriers runner was pleased to have topped the podium in her third outing at the Edinburgh Marathon Festival in 1 hour 19 minutes and 49 seconds. The 43 year old said: "I&apos;ve ran the full marathon three times, but this year I felt like I was ready for a half marathon. Towards the tail end of last year I was running really well." "I lead all the way from mile two. There&apos;s definitely a great crowd presence throughout the whole run and support all the way round which is really nice!" Birmingham&apos;s Molly Browne clinched second place with a time of 1 hour 19 minutes and 57 seconds, with Emma Ballantyne from City of York AC finishing third in 1 hour 21 minutes 57 seconds. Afterwards, Vincent said: "This is my second year in Edinburgh. Last year I wanted to run but unfortunately broke my foot, so it was great to come back and take first place this year. It&apos;s such a beautiful city!" The women&apos;s winner was 22 year old Alice Burgin from Bedford with a winning time of 37 minutes 52 seconds. She said: "The course is really nice and scenic, very warm! Great crowds, lots of support and cheering along the way which really helped me out." Italian Lorenzo Masi, 30, stormed home first in the sunshine to clinch the 5K title with a winning time of 17 mins 29 seconds. He said: "I discovered this wonderful city one year ago because my girlfriend lives here. I&apos;ll absolutely be back - next year I will run again!" Youth stole the show in the women&apos;s field as 18 year old Anisha Badial was the first female home with a winning time of 19 minutes 51 seconds. Anisha, who runs for Aberdeen AAC, said "I was second last year so I&apos;m delighted to clinch first place this time around." Around 850 youngsters took part in Saturday&apos;s junior races, consisting of the 1.5k for 6-8 year olds and the 2k for 9-12 year olds, as well as both the Junior 5K and the Kids Kilometre for the first time ever. 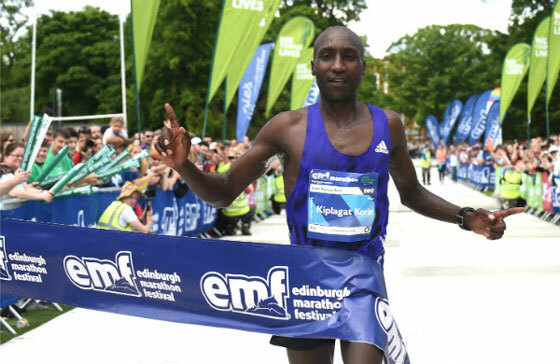 Neil Kilgour, Edinburgh Marathon Festival Director, said: "2017 has been another incredible year for Edinburgh Marathon Festival with record-breaking performances, tens of thousands of participants and millions raised for good causes. "We are proud to host a truly world class running event in Scotland&apos;s capital for people of all ages and abilities from across the globe. Congratulations to everyone who took part. Thanks for making the 2017 Edinburgh Marathon Festival one of the UK&apos;s greatest mass participation events. Come and see us again next year!"